Tapulanga Foundation blog: Cat Cat Needs Help in Her Schooling! The Tapulanga Foundation is looking for a donor/s to sponsor Cat Cat. 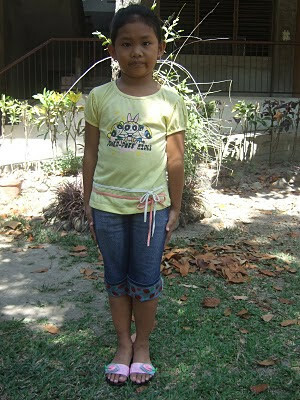 She would like to continue to 2nd grade in SFAS in June 2010. I am Juliana Cathreen Gomez. You can call me Cat Cat. I was born in November 3, 2002. I live in Baranggay Alicante, E.B. Magalona. My father is Julieto and he is very sick and is not working. My mother is Erna and she stays home to take care of my father. I have an older brother, John Joshua, who is 9 years old and studying in a public school. My favorite food are fried chicken and ice cream. I help sweep and mop the floors at home. I want to finish my schooling in SFAS. I have been a consistent honor student in 1st grade. It costs Php7,000 or $160 a year to send Cat Cat to school. Add Php2,000 or $50 to include her books.